With a stay at this apartment, you'll be centrally located in San Sebastian, steps from Concha Beach and within a 5-minute drive of Ondarreta Beach. This 4-star apartment is 2.7 mi (4.3 km) from Monte Igueldo and 3.5 mi (5.7 km) from Basque Culinary Center. Soak up the seaside scene at San Sebastian from our elegant TRYP San Sebastian Orly hotel near La Concha beach. This fashionable resort town offers cultural riches, beautiful beaches, delicious cuisine and hip nightlife. 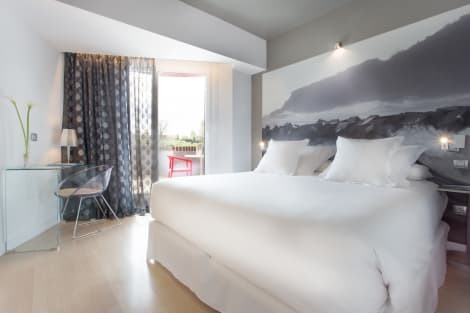 Our recently renovated San Sebastian, Spain, hotel is located in the city center, next to the famous Paseo de La Concha promenade.Choose a stylish family, fitness or premium hotel room and enjoy magnificent views of the crystal blue Bay of Guipuzcoa. Start your day bright and early with our premium breakfast buffet, and stay connected with free Wi-Fi internet access throughout the hotel. Consult our savvy staff about the must-see attractions near our San Sebastian, Spain, hotel. If you need to get work done, book our meeting space. Enjoy Basque cuisine at Restaurante Morlans, a restaurant which features a bar, or stay in and take advantage of the room service (during limited hours). Buffet breakfasts are available daily from 7:30 AM to 10:30 AM for a fee. The Barcelo Costa Vasca is situated in the residential area known as Ondarreta, very close to the beach and near the gardens of the Miramar Palace. The hotel offers 203 rooms completely equipped to guarantee the comfort, and also some conference rooms to satisfy guests' necessities. This 4-star hotel has an outdoor pool set within its garden and also boasts a fantastic health and wellness centre. At the hotel's restaurant Ulia, you will enjoy an extensive menu that ranges from Basque traditional food to nouvelle cuisine. The hotel has been awarded the Q Mark for Spanish Tourist Quality awarded by the Institute for Spanish Tourism Quality. Visit San Sebastián, land of beaches, hills and museums... the ideal place to practise your favourite sports and relax. Featured amenities include a business center, complimentary newspapers in the lobby, and dry cleaning/laundry services. Planning an event in San Sebastian? This hotel has facilities measuring 3014 square feet (280 square meters), including conference space. Self parking (subject to charges) is available onsite.